MainAll NewsJewish WorldJ'lem Day Celebrations are On! J'lem Day Celebrations are On! The question of how & where Jerusalem will celebrate Jerusalem Day has been settled – by compromise. Celebrants will march through Damascus Gate. The question of how and where Jerusalem will celebrate Jerusalem Day has been settled – with a compromise. Celebrants will march through Damascus Gate. 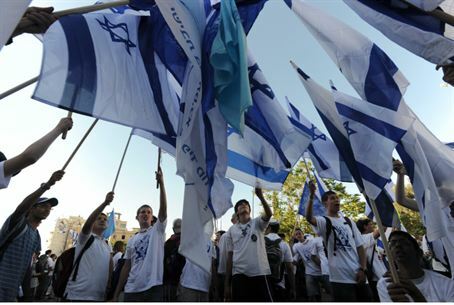 The by-now traditional Rikudgalim (Flag Dance) March takes place every year in Jerusalem on the anniversary of the city's liberation and reunification, with the participation of close to 100,000 people. Its route has always been down the city’s central axis, Jaffa Rd., leading to the Old City. This year, however, because of the new light-rail system that has taken over the street and its still-ongoing practice runs, the Municipality did not license the regular route. The city said it had contractual obligations to the light-rail owner company, banning it from closing down Jaffa Rd. for more than five days in a year – a quota that does not include Jerusalem Day. A three-justice Supreme Court panel ruled on the matter, issuing the following compromise order: The marchers will not march this year on Jaffa Rd., but will rather march on Route 1 and on HaNeviim (Prophets) St., to the north of Jaffa Rd.. Some of the marchers will enter the Old City via Damascus Gate, while the others will march around the Old City Walls to the north and enter through Dung Gate. Both the police and the organizers will have to follow special procedures. The city will contribute 100,000 shekels to the Am K’Lavi (Nation as a Lion) association for the running of the event. Jerusalem Day, to be marked next Wednesday, marks the 44th anniversary of the IDF Paratroopers Brigade’s capture of the Old City and environs in the Six Day War. The day’s events also included the Ammunition Hill battle, the unfurling of an Israeli flag on the Temple Mount, and the liberation of other areas in Judea and Samaria. The anniversary is commemorated with various special events in Jerusalem; details to be announced.